The dress rehearsal, which was carried on on 29 June, simulates the procedures to be carried out on the day of launch from launch minus 10 hours to launch plus 30 minutes when MSG-3 separates from the luancher. 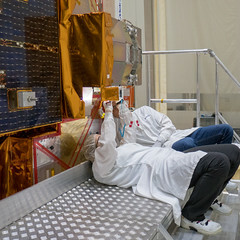 During the rehearsal, teams worked where they will be during the real launch, including the LBC room where the satellite is monitored and the Jupiter-2 control room. ESA’s European Space Operations Centre, ESOC, in Germany were also in the loop. The next milestones are: Launch readiness review on Tuesday Roll out of launcher on Wednesday Launch on Thursday. The launch window opens at 23:36 and closes at 00: 05 (CEST).